View product information online or click to download pdf. The EMS Oscillating Tissue Slicers for the most challenging of sectioning with the highest quality. The EMS 4500 and 5000 Oscillating Tissue Slicer represents the most thoughtfully designed solution to sectioning either fixed or fresh tissue. No longer is there a need for embedding or freezing your sample and preparation time is reduced dramatically. The risk of distortion and artifacts normally associated with these procedures are eliminated. The EMS 4500 and 5000 meets the highest standards for precision and accuracy and it meets or exceeds the performance of units on the market costing twice as much. The EMS 5000 series may be used for the sectioning of samples for use in the fields of electrophysiology of fresh tissue, immunocytochemistry and immunohistochemistry, Neurophysiology, Neuropathology, Experimental Biology, Histology, Cytology, Botanical Research, Microscopy, Polymer and Materials Science. The EMS 5000 now features a new innovative design of the slicer head which minimizes Z-Axis vibration. This improvement dramatically improves slice surface integrity and is especially beneficial in the field of fresh tissue where IR/DIC imaging methods are concerned. The unique blade holder has now been modified to accept: razor, sapphire, diamond and glass blades. To reduce time between slices the EMS 5000 series features a user programmable travel window (cutting window). This allows the sectioning cutting range of the blade to be customized to the specimen sample. This feature of "automatic sectioning" offers a beginning advance and end advance further automating the EMS 5000. In conjunction with our "home button" the programmable window guarantees rapid sectioning of even the largest of specimens. 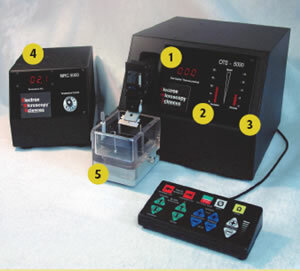 As well, the EMS 5000 allows the sectioning of samples in two different modes. In single slice mode, the unit sections samples and harvests them while the blade repositions itself to perform the next slice and in the multiple slice mode the EMS 5000 will automatically perform multiple uniform slices. The EMS 5000 series control panel has been totally redesigned to allow for ambidextrous and ergonomic operation. The keypad has been sealed to avoid buffer spill seepage. The tray is made from molded clear polycarbonate for improved viewing of the slicing operation. The tray is removable to facilitate specimen mounting and cleaning. Two white LED's are installed in the blade head, which provide constant cold illumination of the specimen during the slicing process. The EMS 5000 series is engineered for maximum stability ensures even the most delicate of tissue to be cut successfully every time. The knife holder allows any blade (as per list) to be secured and the blade angle set from 10-20 degrees. The specimen mount is x, y, z axis adjustable and the knife advance is continuously adjustable with a touch of the keypad from 0-5mm/s and the section thickness is now adjustable in 1 micron increments ranging from 1-999 microns. Our precision slicer features automatic touch selection of section thickness, blade speed, advance, and a user-defined travel window so that the consecutive sections may be cut easily and rapidly. Other EMS 5000 features include: Touch pad control of the blade height, slice counter / slice thickness, precise bar graph displays of blade oscillation and advance speeds. Blade oscillation is adjustable from 50-5000 cycles/minute and advance speed is adjustable continuously from 100 microns - 5mm/sec. Our EMS 5000 series is designed for easy operation and maintenance. The specimen collecting tray is removable and easy to clean. All controls may be set with one hand with options for multiple slicing modes. The unit comes complete with gooseneck magnifying lens, media tray (2.5" wide) and pedestal, specimen vice holder, blocks, as well as a foot switch with 6' cable. A large tray (3.5" wide) is available as an option and comes complete with fixed stage and adjustable pedestals. The tissue pedestal with pivotal pin (included with media tray), allows for the mounting of a specimen directly to the pedestal and the ability to change the angle of your specimen relative to the blade, offering you perfect specimen orientation. The sample vice with pivotal pins (also included in package) allows for the adherence of your specimen directly to a mounting block. The EMS 5000 series meets the highest standards for precision and accuracy. It meets or exceeds the performance of units on the market costing twice as much. Cutting window for automatic sectioning allows for faster and more reliable sectioning. Control pad with membrane buttons is now separated from the slicer module improving ergonomics and reducing buffer spillage from contaminating the controls. X,Y, and Z – 3 axis adjustable specimen mount. Easy to release slicer head for safety and ease of specimen mounting. Slice thickness is now adjustable from 1-999 in 1 micron steps. One touch "home" button to return the blade arm to a predetermined point near the specimen. The specimen tray is made from a clear polycarbonate for improved viewing of the slice operation. No worry of leakage and section visualization in easy. The pivot pins which come as a standard on the pedestal as well as the vice holder allow changing of the angle of the pedestal relative to the blade. Easy sample orientation in all directions. The tray includes a lock on feature for a more secure mount to the platform. The standard unit comes complete with our unique pivotal tissue pedestal (you can mount the specimen directly on the pedestal without the need for vices or blocks mounted in the sample tray). The EMS 4500 can be upgraded to the complete EMS 5000 unit at any time. The EMS 5000 Refrigerated Controller and Tray provide refrigeration capabilities to the 5000 Tissue Slicer. The controller three digit LED displays the current temperature of the bath medium in degrees C. The temperature is maintained within 0.5°C. The temperature range on the unit is between 0-10°C. The refrigerated tray is fitted with a peltier heat exchange unit. A cold water source is circulated through the assembly to transfer heat. The tubing is connected to the tray with quick connect fittings. No tools are necessary for installation. The fittings are self sealing to prevent leaking during installation. The tray fits directly to the mounting platform of the EMS 5000. Displays a count of the number of slices from a user defined zero reference. When prompted, displays the slice thickness setting in microns. Displays the speed of the blade oscillation in bar graph form. Each line of the graph represents a speed. Displays the speed of the blade advance in bar graph form. Each line of the graph represents a speed. 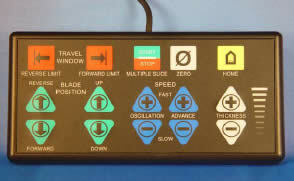 Control pad with membrane buttons separated from the slicer module to improve ergonomics, reduce "handedness", and isolate switches from bath solutions. New slicer head design increases blade motion stability and minimizes vibration that causes tissue distortion. Slice thickness from 0 to 999 microns, set in 1 micron increments. Push button advance; digital display of status. Easy release slicer head facilitates safe, easy specimen mounting as well as easy cleaning. Ultra light blade oscillation mechanism. Accepts metal, glass, diamond and sapphire blades. 3 axis adjustable specimen mount (X,Y,Z). User defined "travel window" reduces blade travel time between slices. User selectable slicing modes for "hands-free" performance of many slices. Precise bar graph displays of blade oscillation and advance speeds. Consistent live tissue slices of 10 microns achieved. Adjustable/Removable magnifier lens X2-Swings away when not in use. White LED's mounted to knife holder for constant, direct, cold source illumination during slicing. Blade mechanism above bath simplifies maintenance; easy to clean removable tray. Mounting of the specimen can be done directly on our unique tissue pedestal (with the option of using the pivot pin [see Diagram 1] or just setting the pedestal flat on the bottom of the tray on a 90° angle [see Diagram 2] in addition a sample vice holder, with pivot pin can be attached to the tray and mounting blocks used [see Diagram 3] – (both devices come standard with unit). Adjustable knife angle indicator is built into the arm of the unit. Forward: Moves the blade arm forward at the set advance speed. Press once to begin movement, again to stop. Reverse: Moves the blade arm back at the maximum travel speed. Press once to begin movement, again to stop. Up: Moves the blade arm up. Momentarily pressing the button moves the blade arm the set thickness amount. Pressing the button for longer then one second moves the blade at the fastest travel speed. Down: Moves the blade arm down. Momentarily pressing the button moves the blade arm the set thickness amount. Pressing the button for longer then one second moves the blade at the fastest travel speed. Oscillation: Pressing these buttons increments (+) and decrements (-) the blade oscillation speed. Advance: Pressing these buttons increments (+) and decrements (-) the blade arm advance speed. Pressing these buttons adjusts the slice thickness. Pressing momentary changes the setting in 1 micron increments. Holding for longer then 1 second causes 10 micron changes. Reverse Limit: Pressing this button sets the position for the blade arm to start the slice process. The limit can be changed using the blade position buttons at any time to override the limit. Pressing this button again will set the new limit. Forward Limit: Pressing this button sets the position for the blade arm to stop and return to the reverse limit. The limit can be changed using the blade position buttons at any time to override the limit. Pressing this button again will set the new limit. Start/Stop: Pressing this button starts the process of automatically slicing. Pressing this button once will begin the blade arm moving forward. It will continue until it reaches a forward limit (travel window or mechanical) stop, return to the reverse limit, step down the selected thickness, and begin another slice. Pressing this button during this process will cause the arm to stop and wait for a command. The multiple slice process will continue until the lowest mechanical limit is reached. It will then automatically return to the home position (full up and back). Pressing this button resets the slice counter display to read all "0". Pressing this button at any time will cause the blade to return to its full up and full back "home" position. Mounting of the specimens can be done directly on our unique tissue pedestal with the option of using the pivot pin (see Diagram 1) or just setting the pedestal flat on the bottom of the tray on a 90° angle (see Diagram 2). 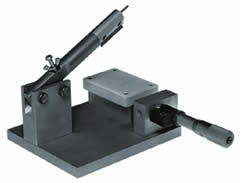 In addition, a sample vice holder, with pivot pin can be attached to the tray and mounting blocks used (see Diagram 3). Both devices come standard with the EMS 5000. The cutting angle can be easily changed and calibrated by loosening the set screw on top of the support arm. The angles between 10-20° can be read off the scale on the side of the support arm. The pivot pedestal arrangement is designed so that the sample can be glued directly to the surface and the angle of the sample can be adjusted relative to the blade. This is the same pedestal as in Diagram 1; however you have the option to mount the pedestal flush to the base on a 90° angle. The sample vice which is provided with the system can be easily alternated with the pedestal. 1.2cm square mounting blocks (provided with the system) or the other pegs are held by the vice clamp. Lighted: White LED's mounted on the knife holder aimed at blade edge. Display: 3 segment LED display of slice counter and thickness. (Changes with appropriate buttons) 20 segment LED's bar graph display blade oscillation and advance speed. Specimen Mount: X, Y, Z axis adjustable pedestal: 1¾" x 2 ½"
Temperature Indication 3 digit LED display indicates temperature in 0.1oC with a negative sign indicator. To make your job easier we have put together a kit of accessories that will assist you when using our Oscillating Tissue Slicer. Complete Kit includes: Sable brush, Parafilm 4 x 250', Quick Bond (5 tubes/pk), Kimwipes, Set of tweezers (#5, #6, #7) Fontax, Specimen forceps (4", 6"), Sample specimen bottle with cap-8ml (6per pack), Glass Microbeakers 5 ml (6 per pack), Glass Microbeakers 7.5 ml (6 per pack). All items in the kit can be purchased separately. 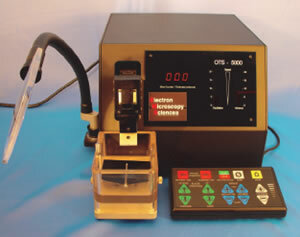 Electron Microscopy Sciences is committed to offering you the most up-to-date equipment on the market. For this reason if you would like to see us implement any changes to our Tissue Slicers or any of the products that we sell please let us know. All ideas and suggestions are encouraged and we look forward to hearing from you. The TC-1 Tissue Chopper is designed to facilitate the cutting of 100-1000 micron thick brain tissue slices for use in recording experiments. The chopper includes a guillotine arm with adjustments to assure blade alignment. The brain sample is moved in respect to the arm with a stage whose position can be read with 2 to 3 micron precision on a digital micrometer scale. The stage is made with a removable "PTFE" surface plate to facilitate cleaning.